Below is a list of eligible food stamp items that you can purchase using your Iowa EBT card. These food items can be purchased at stores that accept EBT food stamps. The aim of the Iowa SNAP benefits program is to provide nutritious foods to eligible low income individuals and families. As a general rule you can use your Iowa EBT card to buy any food items except for food that is hot when sold, or food that's sold to be eaten in the store, like restaurant food. In some locations restaurants could be authorized to accept the Iowa EBT Card from qualified disabled, elderly, or homeless people in exchange for low-cost meals. 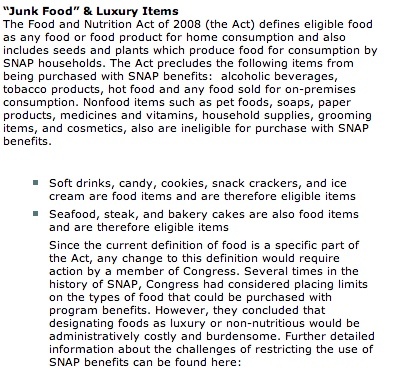 Your Iowa SNAP benefits also allow you to buy some junk foods and luxury items. The guidelines created by the United States Department of Agriculture (USDA) is outlined below. From the USDA guidelines above, you can purchase the following items using your EBT card. Below are some common questions about what you can purchase with your Iowa EBT Card. Can you buy formula with food stamps? You can use your Iowa SNAP Benefits to buy baby food. Items include infant formula, cereals, juices, and baby food in boxes and jars. Households cannot use their food stamps to purchase any nonfood items, which includes pet foods. Can you buy vitamins with food stamps? You can buy any edible food except hot foods prepared for eating immediately. You cannot buy non-food items such as alcohol, pet food, vitamins, or grooming products. Can you buy coffee with food stamps? You can buy coffee including instant coffee and iced coffee. The only kind of coffee you can't buy using your EBT card is hot coffee. EBT SNAP benefits do not allow the purchase of hot liquids.